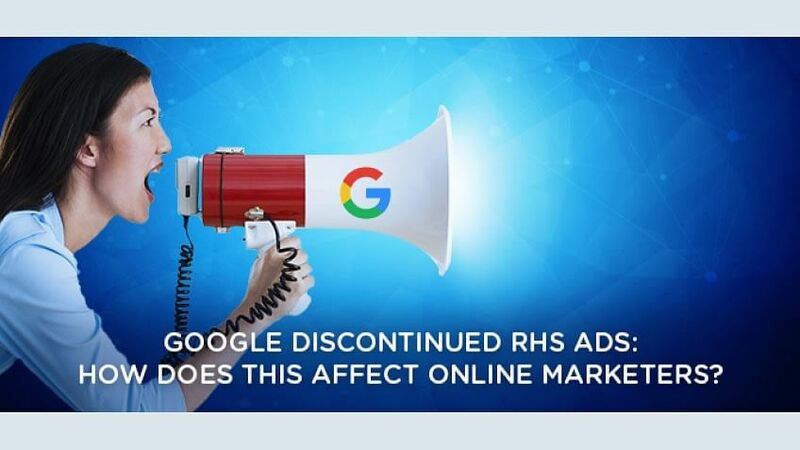 Google Discontinued RHS Ads: How Does This Affects Online Marketers? Around December of 2015, Google started testing 4 ads on the top and none on the right hand side of the search results. 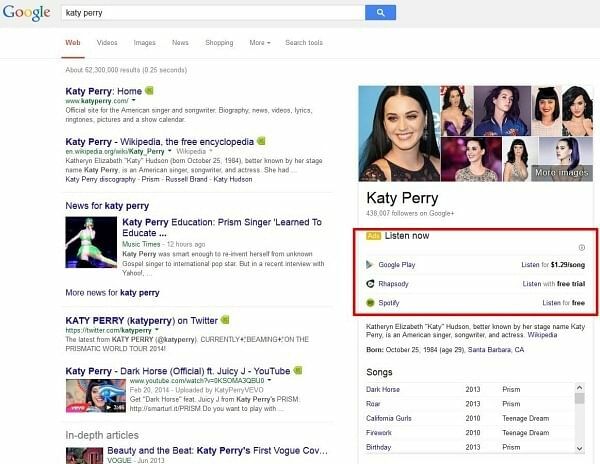 This change was to replace the format associated with the Google Search engine results page that we had gotten used to for as long as most of us can remember. Before there were a total of 11 ads on the page, with a mix of top, bottom, and right-hand-side-heavy ads; now we see a total of 7 ads: 4 at the top and 3 at the bottom. Additionally, the new format includes more emphasis on Ad extensions. That being said, it is still hard to gauge if these additional features have improved the ad experience on Google. As with most tests that Google makes, it has been bitter and sweet for different search stakeholders. The biggest impact seems to be for advertisers and for regular organic SEOs. Some advertisers are happy with the changes but most regular organic SEOs are not thrilled. In retrospect, the changes were easily predictable–given that Google had indicated that they wanted to bring their desktop search results to be in line with what mobile searches looked like. The change begs the question: how will these changes affect your SEO strategy and your CPC (cost-per-click) strategy? And what should you do now that these changes seem to be here with us to stay? Below, we shall take a closer look at exactly what is happening and examine the above-mentioned questions to determine the best way forward for regular organic SEO and for paid search. But first, let us start at the beginning. 1. How did paid search work before on Google? For as long as most of us can recall, when you searched for something on Google, you were able to see a total of 11 ads on the page that came up. The ads were positioned above, below, and to the right of the organic (not paid for) results. For those promoting their websites through paid ads, the goal was to get the first three positions because these would yield the highest click-through-rate (CTR). These 3 positions were above the organic search results. The second best position to have your ads as an advertiser would be the right hand side of the Google search engine results page (SERP). The not-so-good position would be at the bottom of the page below the organic search results. The graph above, by Acuracast.com, highlights the average CTR for Google AdWords for position 1 through 9. From the graph we can see that the first three positions have a higher click through rate than all the remaining positions combined. 2. Why Google removed right side ads? So, what necessitated the change by Google from how it used to be, to how it is now? Well, with Google you never really know what the exact reason is unless they release a statement, which they haven’t, done so far. 3. What are the new changes in Google ads? The search engine results page will have 17 listings (Ad-related and organic listings), instead of the 21 that were there before. The changes on desktops were to take full effect by the beginning of March. 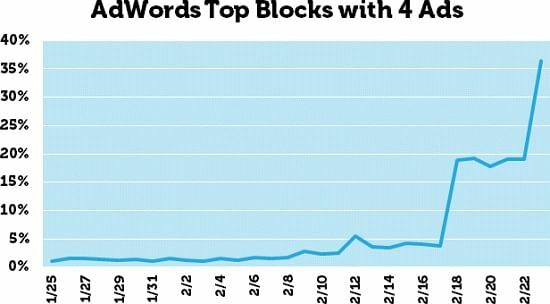 The image above shows the % change in top blocks with 4 Ads. You can read more about the changes as they rolled out in the article “Four Ads on Top: The Wait Is Over” by DR. Peter Meyers in Moz.com. You may be curious to know, what are these so-called “highly commercial queries”? Apart from the changes mentioned above, the following changes have also been observed. Ad extensions including ratings/reviews, sitelinks, consumer ratings and a few others are still going to be displayed in the new ads layout. However, more importance will be put on these Ad extensions. This ad strategy by Google seems to align with what Google announced late in 2013 about extensions being a new important component in the quality score of sites on the SERP. As an advertiser, you should therefore lay more emphasis on creating more valuable ad extensions. The new changes are to affect all countries and all languages, in line with the changes that were recently made in organic search in January this year. There is no specific information or statistics from Google about the impact these changes will have on search queries. However, based on what people have seen so far, the changes will not significantly affect the quantity of search queries. The most obvious change to desktop search versus mobile search is that desktop search now excludes the right hand side ads. 4. What is the Impact of No Right hand side Ads? In light of these changes what will the impact be on all stakeholders? They will very likely earn more income from paid advertising on search result pages. The organic search results will appear lower on the SERP which means that the ads on the page will seem more front and center on the page for users. That being said, the quality of the ads on top of the SERP will very likely be much better for the user. Since there will be less content or no content at all on the side bar or right-hand-side of the SERP, users will have to adapt to a more mobile-like or linear-like approach on desktop searches. This will most likely be a better experience for most search users. More than ever before, it will be important to have a good SEO strategy. This is because there were 21 listings on the SERP but now there will be only 17, meaning much more competition. Additionally, users are more likely to click on results on the first page. This means that website owners will need to put in more effort to get to page one of SERP. The biggest impact will probably be on advertisers, since bidding for the available 7 listing spaces will be highly competitive–especially for the first 4 positions. Google AdWords campaigns will need to be of a higher quality in terms of optimization in order to make it to the top 4 positions. Once advertisers make it to the top 4 ads, they are likely to have a higher click-through-rate. The changes may also mean a higher cost for advertisers when bidding for these top positions. For the advertisers seeking the top 4 ad positions, indications so far show that, the ROI (return on investment) will still be good enough, even if the competition is much higher. As an advertiser, if you target below position 7 in AdWords the most likely result will be a sharp drop in impressions. Since we are likely to see a change in users click behavior, there may be a shift in the performance of different ad positions. Google Shopping results may get a higher click-through-rate cue to their greater prominence. 5. Impact of No Right hand side ads for your online marketing campaigns? In order to ensure that you have front page visibility on SERPs, you will need to have a very strong SEO strategy. You may also need to include a CPC strategy if you did not have one before. Furthermore, there is likely to be a marked increase in attention to Google My Business and Google Product Listings. Since the Knowledge Panel is also going to be quite important, a well populated Google My Business page and more attention to geo-location are probably likely. For those with e-commerce sites, paying more attention to Google Product Listings will be more important than ever. It’s not all bad news for your marketing campaign, there are some strategies that you can employ to lower your cost per click (CPC) and still keep your visibility or exposure high on SERPs. We shall have a look at some of these strategies below. Since organic searches will be pushed below the first 4 ad positions on top of the SERP, this means that competition will be stiffer for organic listings. Additionally, advertisers who had a small budget for paid ads, may now divert their resources towards better organic SEO. This will make organic SEO even more competitive. Also, if you put a bigger focus on your SEO in order to get it on one of the fewer positions, on the first page, you are likely to improve your website and make it a better experience for your users. The laws of supply and demand can be used to predict what these changes will mean in terms of cost per click (CPC). On the one hand, we can interpret the laws of supply and demand to tell us the following: since there will be fewer ad positions on the front SERP (7 instead of 11), meaning lower supply, there may be an increase in CPC over time due to the increased demand for those top positions. On the other hand, the same laws of supply and demand can be used to give us a very different interpretation: since there are now 4 top spots instead of the previous 3 top spots, this could actually mean lower prices at the top 4 positions since there is now more supply at the top. We will just have to wait and see what happens. 8. Does this mean a strategy change for you? For starters, many advertisers held the view that competing for position 4 and 5 was a good strategy to have since it meant that the ad would make it to position 1 and 2 on the right hand side. This position had a very high conversion rate and a higher ROI (return on investment). Now, making it to position 4 and 5 could mean a huge difference between being at the top of the SERP or at the bottom of the SERP and not on the right hand side of the search results. As mentioned earlier, you may need to put more emphasis on your Google shopping and Google Product Listings strategy. If you sell certain niche products like baby supplies, certain tools, furniture or automotive parts then you should use Google Shopping and Google Product Listings, because you are likely to benefit significantly by doing this. For products that get a lot of clicks, for example clothing, it may be quite difficult to benefit from using Google Shopping and Google Product Listings because of the stiff competition. What is your budget? Well, it will depend on what you sell. That being said, most experts recommend that ideally, you should have a minimum budget of about $1000, to run a good a good campaign. If your SEO is not polished but is still rough around the edges, then you should probably concentrate on polishing your SEO before spending time/money on Google Shopping and Google Product Listings. You will need to pay more attention to how google chooses content for the Knowledge Panel on the right hand side block. You will also need to know how you can create a knowledge panel. 9. So, what do you do now? Consistently measure and evaluate the success of your organic and paid strategies. Specifically, you will need to learn how the changes listed above affect different facets of your online marketing strategy. Leverage the tools that are available to you including Google analytics to keep tabs on any changes that you make to your strategy. To have more visibility and relevance in paid search, you need to make sure that you maintain a top 4 position. For both organic and paid strategies, ensure that the content strategy on your website includes a landing page that appeals to people who make queries with a strong intent to buy or join in. Charles Benzu writes on a wide range of topics from entrepreneurship, career, digital marketing and forex trading. He has a passion for science and technology. Charles was professionally trained as an accountant going on to pay his dues for 7 years before branching off to follow his passions.